Executive MBA student Alex Thompson and his celebrity-owned employer, Patti’s Good Life, have experienced the power of social media firsthand. The video went viral, and the pies started flying off shelves even faster. People started selling them on eBay for hundreds of dollars. 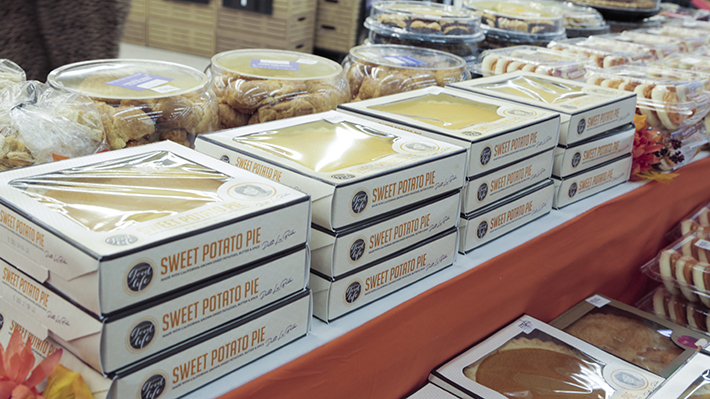 Walmart’s demand was so high that part of the recording that callers heard when phoning stores apologized for the unavailability of LaBelle Foods’ sweet potato pies. To date, the video has more than 5 million views. On top of all that, Thompson, who earned his undergraduate degree in business administration in 2009 with concentrations in finance and business law, had recently enrolled in LeBow’s Executive MBA (EMBA) program and was just finishing up his first quarter of classes. Thompson landed the position with Patti’s Good Life after his family’s small batch specialty food company, Lancaster Fine Foods (LFF), starting producing sauces for Patti’s company. When she decided to expand into baked goods, she brought Thompson on board to help run the company’s operations. Simultaneously, Lancaster Fine Foods is also in the middle of a huge expansion —nearing the end of construction on a $5 million factory. The company’s growth rate is 35 percent. Thompson works for this company as well — he essentially has two jobs. Thompson commutes from Lancaster to Philadelphia for his classes just one Friday and two Saturdays a month. LeBow’s EMBA program features hybrid delivery, so some of the coursework is online. Thompson also says the diversity of professional backgrounds of the students in his EMBA cohort make classes really interesting. “I’ll be able to depend on my classmates for perspectives and advice for years to come,” he says. Lancaster Fine Foods is a relatively new small-batch maker of specialty foods. Part of a family of companies called Earth Pride Organics, its product offerings also include Sir Kensington condiments (sold at Whole Foods), and it manufactures the jam used in Starbucks’ PB&J sandwiches. LaBelle was attracted to the company to produce her line of foods, because in addition to its small batch mantra, its nearby location in Lancaster, Pa., is only an hour’s drive from her home on the Main Line. Thompson recalls when the video first came out in fall of 2015. They discovered it after getting a Facebook notification that LaBelle was trending. “She was in London, so we let her know. She watched the video and thought it was hilarious. She called Chanel to thank him. Next thing you know, he winds up at her house for Christmas.” The two also produced a special show for the Cooking Channel together. LeBow hosted an EMBA holiday party and Alumni Award ceremony, honoring Robert Plotkin ‘99 and Anahi Santiago ‘10.